Visit the beautiful town of Giovo Ligure during your holiday in Liguria, Italy. 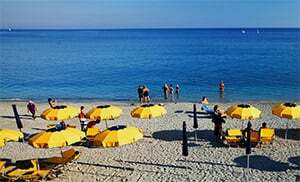 Giovo Ligure (known as Zuvu in the local dialect) is part of the municipality of Pontinvrea in the province of Savona. Having been part of the municipality of Stella earlier on, the village was absorbed into the region of Pontesino in 1966. Actually the village is just a few scattered houses along the Main Street No. 334 near Colle del Giovo (516 m) after which the village was named. During the 2nd half of the 19th century 6 strong castles were built in the region on the orders of Savoier for the strategic defense of Piemont: Forte Tagliata del Giovo Ligure, Forte Scarato, Forte Moglie, Forte Bruciato, Forte Lodrino Inferiore and Forte Lodrino Superior. At the turn of 19th century into the twentieth century that area was a destination for many prosperous Genoese who came there for the hunting season.